To bring the live “Rough Cut Men” Movie Experience to your church, brigade, battalion, or business, check the links at the end of this article. I’m a self-professed movie freak. But, I didn’t know a single thing about filmmaking until I began shooting a new eight-session video series. Eighteen arduous months of travel put our crew at a dozen different iconic movie locations, including places like the game day locker room at Notre Dame (for our ‘Rudy’ episode), on the deck of an aircraft carrier (for the ‘Top Gun’ segment) and on the floor of NASA Mission Control in Houston (for the ‘Armageddon’ chapter). The videos are actually more like mini-motion pictures, integrating my speaking with movie sequences from the respective films and a whole lot of “B-roll”. For you non-filmmakers like me, “B-roll” is what you see on the screen while the narrator is speaking over it. It can take hours to shoot “B-roll” which, in some instances, will only be on the screen for a matter of seconds. For example, the cameraman would put me on a sidewalk and film my shoes as I walked. First from the front, then from the back, then from the sides, then from behind my head, and so on. Over and over again. So, when we found ourselves on Omaha Beach in Normandy, France, to film the “Saving Private Ryan” piece, I was certain that shooting the “B-roll” would be nothing short of a marathon. 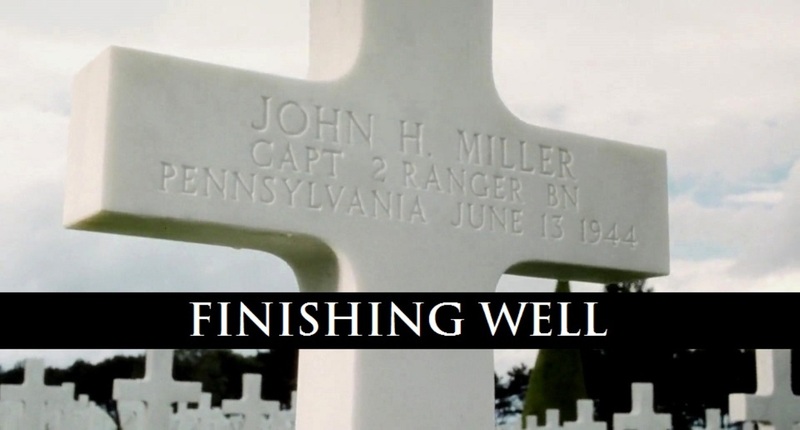 I did a lot of walking for that one — on the beach, in the cliffside Nazi bunkers, through the streets of Colleville sur Mer, and all over the American cemetery. But the walking wasn’t the hardest part. It was the kneeling in front of one of the 9,387 tombstones in the cemetery that proved to be both physically, and emotionally, demanding. “Okay”, the videographer said as he pointed down the row of stones, “just kneel in front of that cross over there.” In case you were wondering, kneeling for twenty minute without falling over can be rough, especially when you have “Over 50” knees. I would hear him behind me, then see him out of my peripheral vision with that giant gyro-camera assembly. He’d zoom into my face, then literally fly it over my head. And all I did, the entire time, was stare at this soldier’s name on the tombstone. He had died on Omaha Beach on D-Day, June 6, 1944, about 500 meters down a cliff from where I was kneeling. Something really hit me as I stared blankly into the cross-shaped marble. It was the formatting. Every one of those nearly 10,000 tombstones has the exact same information on it. On each stone, you’ll first see the soldier’s name, then his rank and unit below that, and finally the state he lived in and the date he died in combat (you can see what I mean by looking at the image at the top of this blog). Ironically, one piece of information that is generally found on a tombstone is absent on every memorial stone in Normandy — a birth date. Not one of them had a birth date. You know, I have no idea how old that soldier was when he died. Was he an 18-year-old kid who happened to be “1A” in the draft and just ended up on that beach? Or was he a 32-year-old guy who decided to join the fight after reading about Pearl Harbor? He could have been any age, from any walk of life, with any background. I know I’ve had days where I feel like I just keep getting buried deeper. You may feel like an epic failure right now. Maybe you said the wrong thing to your kid, or your spouse. Maybe your company just folded and you’re out of a job. Or perhaps you’ve fallen into that same old sin trap…again. So get up, brush the dirt off and get back in the fight. Do you realize that, apart from what’s written in the marble, we know very little about the soldiers in that hilltop field in France? Were they kids? Did they have kids? Were they good fathers? Good husbands? Were some of them divorced and remarried? Alcoholics? Sunday school teachers? Business success stories or totally unemployed? Were they “good guys” or “bad guys” in their families, towns and marketplaces? Here’s the only thing we do know. It doesn’t matter what their lives were like prior to June 6, 1944. Regardless of how each of those 9,387 men lived their lives prior to the war, the only thing that matters is what happened on that solitary date that is permanently etched in French marble. Each of those men died as a war hero. Every one of those men finished well. We should too. David Dusek is founder and director of Rough Cut Men Ministries and author of Rough Cut Men: A Man’s Battle Guide to Building Real Relationships With Each Other and With Jesus. Rough Cut Men has been presented to NASCAR teams, at West Point and the U.S. Naval Academy, at military bases around the world and at hundreds of churches and men’s conferences of every denomination. To find out more about the Rough Cut Men, or to book David for an upcoming men’s event, please check out roughcutmen.org.